Monday: Last One In Is.. – Helen Walter, Ph.D.
Monday: Last One In Is..
We started early this morning, grabbing our gear and getting to the dive shop at 6:30am. All the students checked out their Buoyancy Compensation/Control Device (BCD) and regulators. BCDs are what divers use to attach their tanks to themselves and also allow us to control where we are in the water column. You want to come up, you put air in your BCD, go down, you take it out. The regulator fits on your tank and the other end you have in your mouth. It delivers the air you need to breathe underwater. The first iteration of this was designed by Emil Gagnan and Jacques-Yves Cousteau in 1943, hence why this class is Bio 043! After getting our gear we had to find our boat – we thought they’d said Andrea, they said Andre, but eventually after the musical boats we got all of that together. Breakfast was next, which was great, ham and cheese omelette for me! Then we headed to Roatan Marine Institute for our orientation lecture with Jennifer Keck, one of the scientists and the person in charge of education at the Institute. That done, we got on the boat and headed off for our check out dive. Our first dive was at White Hole. Couple of us had ear issues, but we all passed the mandatory mask and reg check — basically if this equipment came off underwater would we know what to do. Then we swam around for a little and wondered at the beautiful clear waters of the Caribbean. We changed over tanks and then on our second dive at Overheat Reef. For this dive, we changed things up a little. 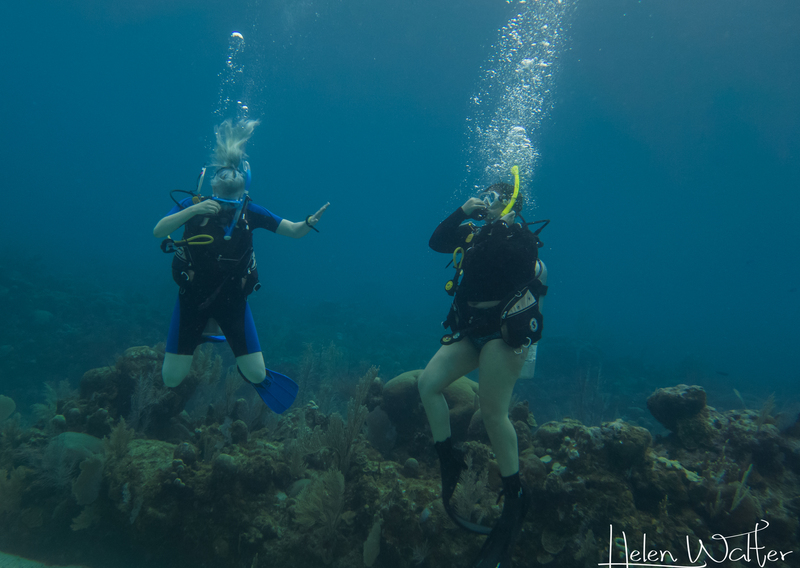 We got the students to explore the shallow area on the reef in their buddy pairs. 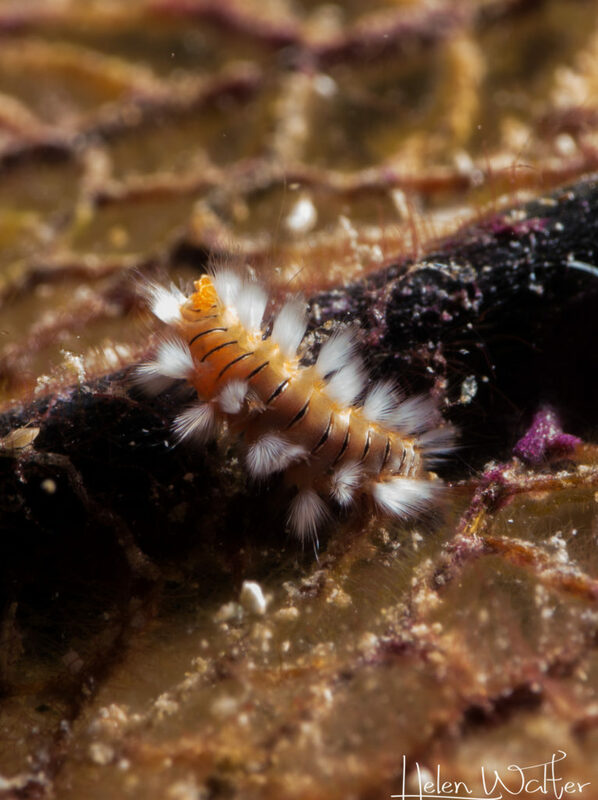 A juvenile Bristle fireworm on a dead fan. Lunch – for most of us was cheeseburger, followed by tiramisu, then off to RIMS for a lecture on coral reef ecology with some coral identification throw in to help with the third part of the afternoon. One of the new things I learned today is that the Caribbean doesn’t have soft corals but Octocorals!! Who knew? 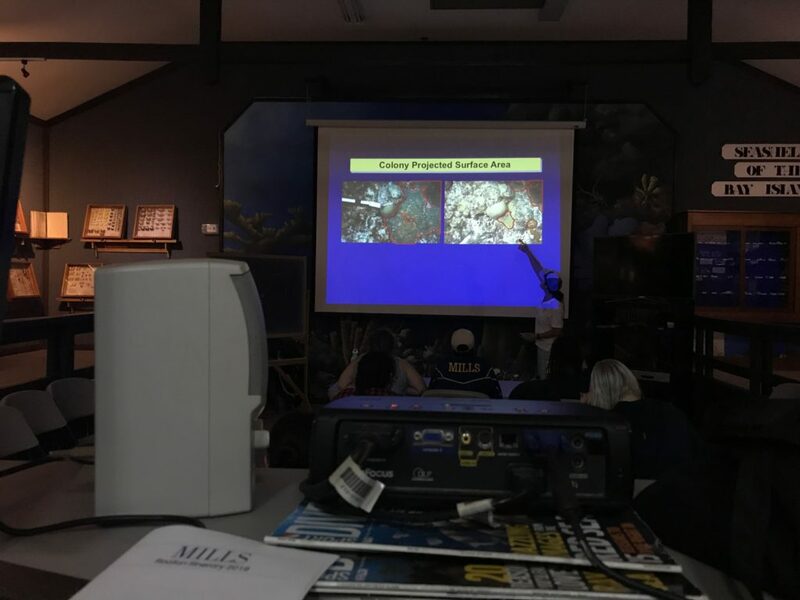 The second lecture was about coral reef threats and the future of coral reefs. RIMS has been monitoring this reef since 1996, taking data and comparing it to get a better idea about the health of the reef. We were, I think, all shocked at the decline in reef populations from 1998 onwards. El Nino followed by Hurricane Mitch really had an impact, and the reef has not managed to recover. So, the scientists at RIMS believe there is something else going on especially as other corals are moving in that weren’t there before. We also learned today that Mills College will have our own coral tree down here because of the money we raised! We will keep you posted! 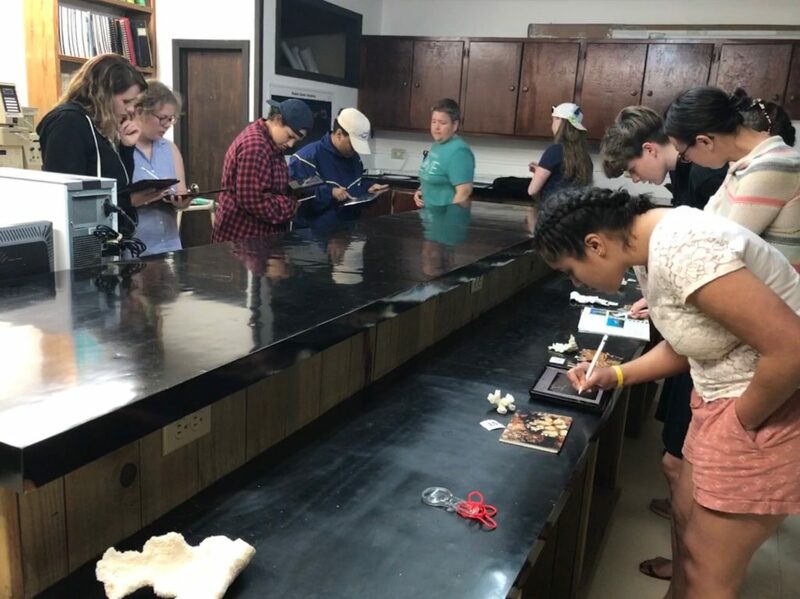 The third part of our afternoon was to head into the dry lab and try our hand at identifying coral from skeletons and photos. The students did an excellent job!! Evening dinner was followed by logbooks, and a debriefing session. We talked about things we did well, and we talked about things we could improve on. Then we played a fun game trying to guess a bunch of movies using charades and one liners. Our day starts tomorrow at 7am! So bed time!